Osteosarcoma is an aggressive bone cancer characterized by anarchic proliferation of immature bone with the production of osteoid matrix. This disease often occurs during the second decade of life and after the sixth one. The most frequent site is long bones. Rhabdoid tumors (RT) are another aggressive pediatric cancer. They are soft tissue sarcomas with monomorphous population of discohesive cells with eccentric nuclei and eosinophilic cytoplasmic inclusions. It most frequently starts from the kidney or the nervous system. Only 25% of patients with RT survive for more than 5 years. The association of these two entities is extremely rare. Only one case has been reported in the literature in Miami in 2016. 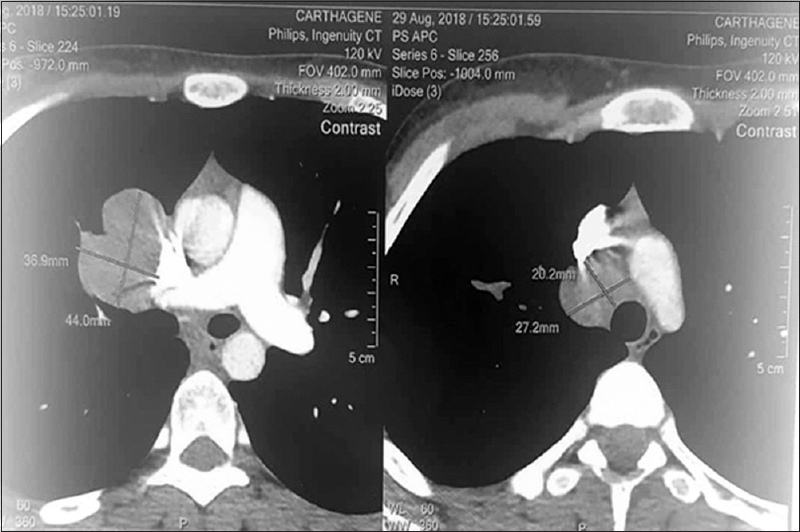 Here, we report the second case of osteosarcoma associated with rhabdoid features diagnosed in a 16-year-old female from Tunisia. 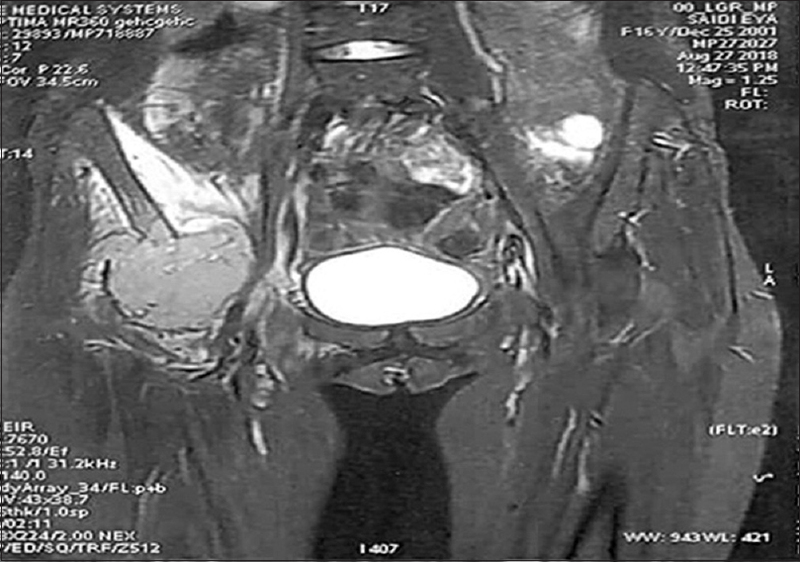 A 16-year-old previously healthy girl presented in September 2018 with a 4-month history of nocturnal right hip pain. Within 2 months, she rapidly complained from asthenia, weight loss, and progressive lameness. Initially, she was referred to an orthopedic surgeon who prescribed physiotherapy sessions. As the outcome was unfavorable, she was explored in an orthopedic surgery department. The examination did not reveal any palpable mass or swelling. 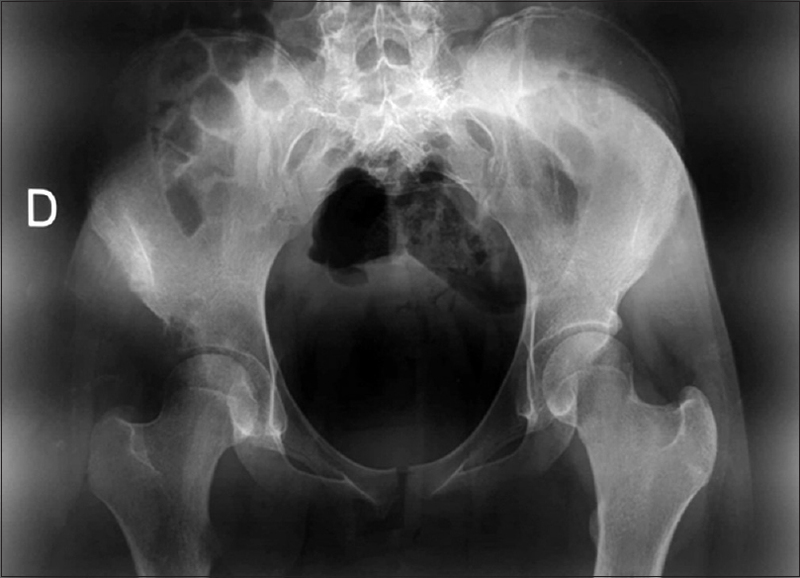 X-ray showed a lytic lesion in the right acetabulum [Figure 1]. The pelvic magnetic resonance imaging revealed a T1 isointense, T2 intermediate signal intensity, aggressive mass, centered on the right acetabulum with lobulated contours. The mass measured 7.5 cm × 7.2 cm and involved the coxofemoral articulation [Figure 2]. A surgical bone biopsy was performed. The histological examination showed a proliferation of undifferentiated malignant cells without any chondroid or osteoid matrix. Tumor cells are voluminous with an abundant eosinophilic cytoplasm and an eccentric hyperchromatic nuclei [Figure 3]. Mitotic figures are very frequent with hemorrhage and necrosis [Figure 4]. The diagnosis of osteosarcoma with rhabdoid features, anaplastic lymphoma, bone metastasis of rhabdomyosarcoma or metastasis of endocrine tumors were discussed. Immunohistochemistry revealed that tumor cells were negative for CD30, desmine, chromogranine, synaptophysin, CD34, CD31, CD68, HMB45, CD1a, CK, and S100. These findings concluded to osteosarcoma with rhabdoid features. Other workup (i.e., bone scan and thoracic computed tomography-scan) revealed multiple mediastinal lymph nodes: superior cavo (44 mm × 37 mm), Barety's space (27 mm × 20 mm), and right hilum (26 mm × 18 mm) [Figure 5]. Mediastinal lymph nodes biopsy showed the same type of tumoral proliferation that was negative for CD45. The patient was planned to receive chemotherapy based on API/AI (adriamycin, cisplatin, ifosfamide with mesna/adriamycin, ifosfamide with mesna). She underwent one course of API with a Grade III nonfebrile neutropenia. A partial relief in her hip pain was noted. The patient developed an acute dyspnea few days later and died at home. Bone sarcomas are rare tumors, making up <0.2% of all cancers. Osteosarcoma is the most common primary bone tumor occurring in adolescents and young adults. The 5-year survival rate for localized osteosarcoma is approximately 70%. The treatment consists in preoperative chemotherapy followed by limb-sparing surgery, with postoperative chemotherapy based on the histopathologic response. The most active agents for the treatment of osteosarcoma are cisplatin, doxorubicin, ifosfamide, and high-dose methotrexate. RT are also rare and highly malignant childhood neoplasms that arise in the kidney, liver, the peripheral nerves, and all miscellaneous soft parts throughout the body. In about 90% of cases, it is caused by mutation in a tumor suppressor gene the SMARCB1. The treatment includes resection of the tumor mass, chemotherapy, and radiotherapy. The combination of these two entities was described only once in the literature. It was in a 69-year-old female who was diagnosed in 2016 in Jackson Memorial Hospital in Miami, USA. At presentation, she had a right femur pathologic fracture. The histopathology examination showed an osteoid matrix with featured rhabdoid cells. Immunochemistry was positive to AT-rich sequence binding protein 2 (SATB2). The patient underwent a distal femur radical resection and reconstruction with an endoprosthesis. She could not have perioperative chemotherapy due to the expiration of her insurance. Survival was unspecified. 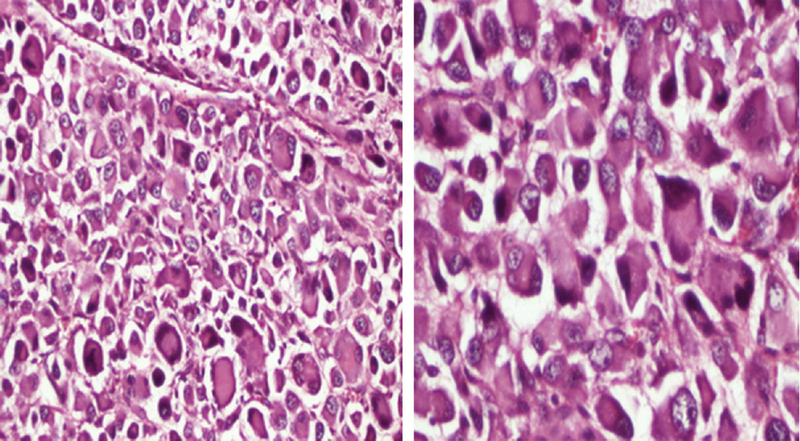 SATB2 is a nuclear protein often expressed in osteosarcomas. Its utility consists in differentiating osteosarcomas from other small round cell tumors of bone., Its positivity in our case would be helpful to establish this new challenging diagnosis. SMARCB1 is a component of the SWI/SNF chromatin remodeling complex located at chromosome 22q11.2. It is ubiquitously expressed in the nuclei of normal cells. However, its protein expression is often lost in malignant RT as a consequence of a biallelic inactivation. Recent investigations had demonstrated its involvement in multiple pathways related to tumor proliferation: The p16-RB pathway, WNT signaling pathway, sonic hedgehog signaling pathway, and polycomb pathway. Molecular biology looking for mutation in the SMARCB1 gene could not be done in our case. The age of our patient is consistent with the diagnosis of osteosarcoma as it is in its age peak. Radiologic investigations showed features of an aggressive bone's tumor (central bone tumor location, local invasion with the destruction of the near articulation). Whereas, anatomopathology results did not find any osteoid matrix neither in the bone biopsy none in the mediastinal adenopathy biopsy. Our patient had a short-term survival, showing that the presence of rhabdoid features may be predictive of poor prognosis. 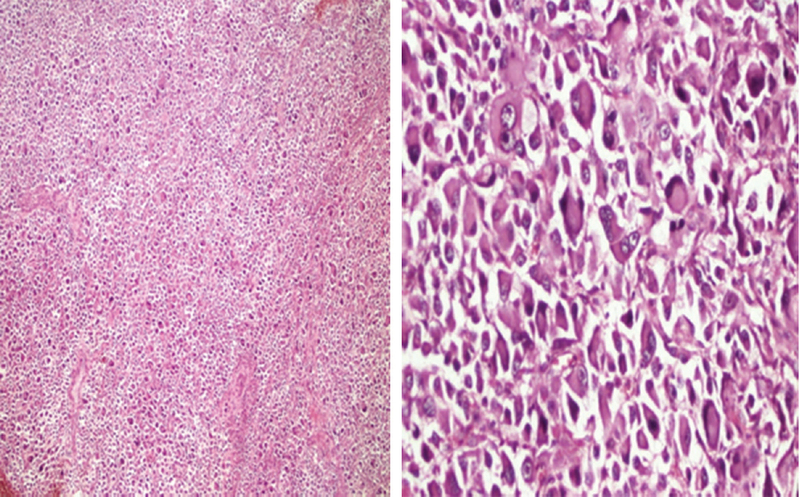 Primary osteosarcoma of bone with rhabdoid features is extremely rare. To the best of our knowledge, only one case has been described in the literature. Diagnosis is based on morphologic characteristics including the presence of osteoid matrix with rhabdoid differentiated cells. Immunohistochemistry confirms the diagnosis with positivity of SATB2. Due to its rarity, treatment plan and prognosis of this entity are not yet codified. Ottaviani G, Jaffe N. The epidemiology of osteosarcoma. Cancer Treat Res 2009;152:3-13. Geller JI, Walz AL. Malignant Rhabdoid Tumor; 06 October, 2018. Available from: https://www.emedicine.medscape.com/article/993084-overview. [Last accessed on 2018 Dec 31]. Seiter M, Al Maaieh M, Rosenberg A, Conway S. Primary osteosarcoma of the bone with rhabdoid features: A Rare, previously undescribed primary malignant tumor of bone. Case Rep Surg 2016;2016:5901769. Agrawal1 RR, Bhavthankar JD, Mandale MS, Patil1 PP. Osteosarcoma of jaw with varying histomorphologic patterns: Case report. J Orthop Case Rep 2017;7:61-4. American Cancer Society – Survival Rates for Osteosarcoma; 17 December, 2017. Available from: https://www.cancer.org/cancer/osteosarcoma/detection-diagnosis-staging/survival-rates.html. [Last accessed on 2018 Dec 31]. Patel SR, Vadhan-Raj S, Papadopolous N, Plager C, Burgess MA, Hays C, et al. High-dose ifosfamide in bone and soft tissue sarcomas: Results of phase II and pilot studies – Dose-response and schedule dependence. J Clin Oncol 1997;15:2378-84. Conner JR, Hornick JL. SATB2 is a novel marker of osteoblastic differentiation in bone and soft tissue tumours. Histopathology 2013;63:36-49. Kohashi K, Oda Y. Oncogenic roles of SMARCB1/INI1 and its deficient tumors. Cancer Sci 2017;108:547-52.